Black women have historically been excluded from political activism and resistance movements. Yet despite the prevalence of intersecting oppressions like racism, classism, sexism, and heterosexism in their lives, notable black women have made their own way and left indelible marks on history. One such woman is leftist writer, orator and organizer Lucy Parsons. 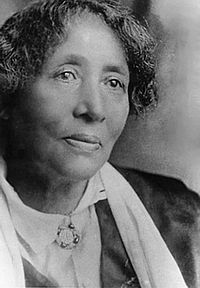 Lucy Parsons was born in 1853 in Waco, Texas, during a crucial moment in Unites States history. Western expansion by white Americans spurred negotiations on the continued legalization of slavery and the future of Native American territories. Violence and lynching against people of color were also on the rise through the creation of white supremacist organizations like the Ku Klux Klan. Parsons would write later about her experience, witnessing lynchings and other acts of violence. Parsons’ early years are not well documented. Sources claim various surnames, but she is believed to be of mixed African American, Mexican and Native American ancestry. Some accounts claim she was born a slave and/or born to enslaved parents. Parsons married former Confederate soldier and anarchist Albert Parsons in 1871. Three years later, fearing the mounting violence from the KKK, they moved to Chicago. Parsons’ activism began there through her involvement as a labor organizer with the Working Women’s Union of Chicago. Parsons quickly became popular for her writing and public speaking. She helped to found the International Working People’s Association (IWPA), and wrote for several publications, including the IWPA’s newspaper, The Alarm. She and her husband helped to organize a protest at Haymarket Square, which would be remembered as the Haymarket Riot. Albert Parsons, along with five others were charged and later hanged for their involvement in the uprising. Widowed and a mother of two, but undeterred, Parsons continued her work in labor organizing. She went on to found The Liberator newspaper after joining International Workers of the World (IWW) in 1905. She wrote extensively in the newspaper on topics such as worker strikes, industrial conflict, and classism. Parsons helped to form The Syndicalist League of America, worked closely with the Communist Party, and continued to speak publicly until a year before her death. Parsons died in a fire in her Chicago apartment in 1942. After her death, measures were taken to erase her legacy. Parsons’ library, papers and possessions were seized by the Red Squad and destroyed. Parsons believed that revolutionary social change was possible through the empowerment of labor unions. She sought to overthrow capitalism and dismantle the federal government by advocating for the creation of a new society self-managed by workers. In her writings and speeches, Parsons addressed the oppression of women and the working class, and was among the first to address lynchings and racial oppression in the South, but largely arguing that capitalism and the economic conditions were to blame. Parsons situated herself outside of accepted circles in every aspect of her racial identity. She othered herself during a time when racial demarcations were entirely forced, distinct and concrete. Ironically, not claiming anything that was forced on her further radicalized her legacy. She never self-identified as African American, but has been categorized as solely African American by several biographers. It is believed that because of the time, the prevalence of the one-drop rule and Slave Codes, and her marriage to a white man, Parsons undermined the static racial categories that sought to discredit her and her husband’s political work. By taking a more holistic approach to her racial and ethnic lineage, Parsons’ defied the existing black-white racial dichotomy to embrace the fullness of her identity as a woman of color. As a result of Parsons' political activism and anarchist ideology, her life was characterized by working to redefine racial boundaries and challenge structures of oppression. Due to the power of her voice, the Chicago Police Department dubbed her “more dangerous than a thousand rioters.” Parsons' radical vision for a just society was decades ahead of her time, making her the predecessor for so many women of color who sought to challenge the system.